The following organ history is an edited abridged version of an article written by Dr Roy Massey for Organ World, followed by an update. The church of St Alban-the-martyr, Birmingham is a splendid example of the Gothic revival style of John Loughborough Pearson, the renowned Victorian architect who designed many fine churches, culminating in his finest work at Truro Cathedral. Built in 1881, the style is a lofty, vaulted, French Gothic, faced in stone and notable for an impression of great space and height rather than for a plethora of gothic detail. Like many of Pearson's churches, the building is magnificent for sound, having a reverberation period of about five seconds when empty. The early history of the organ is obscure, but from a label pasted on the pedal Open Diapason, we learn that the organ was originally built and supplied by Bryceson, Son and Ellis of London in 1881. It was an instrument of two manuals, fifteen speaking stops, tracker action and hand blown, sited in the north choir ambulatory, where it still is. It may well have been a second-hand instrument, for money was very limited in the early days of the building of this great church. About the turn of the century, a six stop choir organ was added on top of the Swell box, the builder being unknown, but is it thought that a local man, Walter James Bird may have been responsible. In 1940, through the generosity of W.A. Clark who sang tenor in the choir, and Mr John Goodman, one of the churchwardens, the organ was completely rebuilt by Rushworth & Dreaper of Liverpool. Space was at a premium in the ambulatory, but by digging a pit beneath the organ for the pedal bourdon pipes, where they now lie on their backs, and by extending the Swell box backwards and placing a new sound board for the Great Organ for the Great Tromba on stilts up against the east wall of the chamber, it was found to make some significant tonal additions to the instrument.A new console, electric action, new reservoirs and oak casework were provided, and all the old pipes were renovated, revoiced and used again in the new instrument. A more unpropitious time for organbuilding would have been hard to find, but in spite of the ever-nearing ravages of aerial attack, the rebuild was completed and, like the church, mercifully survived the war. The following is the specification of the 1940 instrument, improved out of all recognition by the Rushworth additions, and sounding magnificent in general effect. It was opened by the great Dr G. D. Cunningham, City Organist of Birmingham. Stops marked * were added by Rushworth and Dreaper. I had the pleasure of playing this organ for many years when I was appointed organist as a teenager, and many hard working hours were spent at its console. At this time it was also used regularly by the B.B.C. for broadcast recitals, and as a continuo instrument in choral programmes broadcast by the BBC Midland Singers. Many people commented on its immense effectiveness both over the air and in the building. However, like many a young organist, the writer was no exception in being an armchair organ designer as well, and many hours at school were devoted to drawing up theoretical schemes of varying degrees of feasibility in the effort of making the stop list up to date and enterprising. As it happened, my final ideas were jotted down on paper and passed to my friend and successor in the post, Raymond Isaacson, who is now Borough Organist of High Wycombe (at time of writing). Mr Isaacson had a persuasive manner, and before long the Parochial Church Council of St Alban's was prevailed upon to implement the proposals. In 1962 the specification was eventually revised by Rushworth and Dreaper, using old pipes in various guises, and incorporating two entirely new ranks. The Choir Lieblich flute - a most unsatisfactory stop - was replaced by the Great Harmonic Flute. This permitted the installation of a new Octave 4 on the Great, to balance the Large Open Diapason, and to complement the Principal 4, which was contemporary with the small Open. Part of the Great Viola (formally a Dulciana) was cut down, stopped and re-used as the new Choir Nazard, while the old Choir Dulciana provided some of the pipes for the Great Octave Quint which went on the old Viola slide. The Choir Geigen Diapason became a Geigen Principal 4, and a new Tierce rank went on the old Clarinet slide, the Clarinet, with a new bottom octave, became the Swell double reed, replacing the old and very unbeautiful Oboe. There the matter may have rested, but by the 1950s the exterior of Pearson's church, which for seventy years had suffered the ravages of atmospheric pollution and erosion by the weather, was in a shocking state, and almost continuous restoration work on various parts of the exterior had been in progress for nigh on twenty years. The dust and dirt from these operations had by 1970 caused so much damage that the PCC engaged Rushworth and Dreaper to undertake this essential work, plus a re-wiring of the electric action with entirely new magnets. At this stage the writer was called in as consultant, and it was decided to do something about the somewhat unenterprising composition of the Great Mixture, and in the light of this to re-cast the Swell 5 ranker as well. The Great Mixture is now 19,22,26 and the Swell Mixture is 15,19,22,26,29, though to be honest there are some who think the voicer was too conservative in his treatment of this stop, and the old constitution was more dynamic in general effect. The Instrument was again re-opened at Choral Evensong sung by the choir of Birmingham Cathedral, followed by yet another organ recital by the writer, who played, as a link with past glories, one of the two items which had appeared in Dr G.D. Cunningham's programme in 1940. What does it sound like you may ask? This, of course, is very difficult to describe in words, but 'Dyanamic', 'Exciting' and 'Satisfying' spring to mind as very apt adjectives. The choruses are bright and telling, the soft stops distinctive in quality and most effective in this lovely acoustic, though a Swell Celeste would have been useful. The new mutations are very colourful, being quite bold in treatment and not mere simpering synthetics, and the reeds are outstanding, particularly the Tromba rank, which has a fire and brilliance which makes its name rather a misnomer. Within the limits of 27 speaking stops, one can play a remarkably wide range of music, and in its liturgical context the organ is more than adequate. 'Multum in parvo' sum it up admirably, and if ever you are in Birmingham go and see it. My thanks are due to my old vicar, Canon Laurence Harding for permission to write this article and to my friend John Heighway of Birmingham Cathedral for many helpful suggestions. 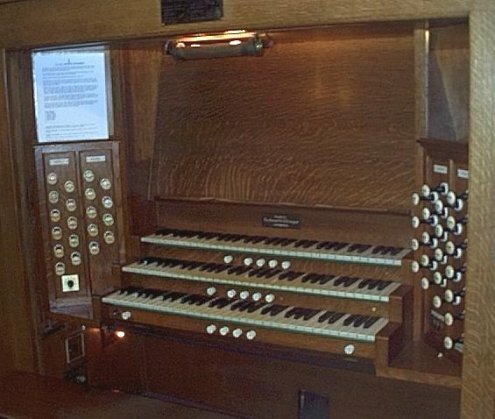 Since this article, the organ has been restored again by Rushworth & Dreaper in 1997. Two new stops were added to the Pedal, Principal 8ft, Fifteenth 4ft. No other tonal changes were made but the keyboard action was replaced with solid state. The organ was re-opened by an organ recital given by Dr Roy Massey. In May 2017 the organ was partially dismantled by Paul Daly to rectify water damage to the Pedal Bourdon (caused during a storm in June 2016 before renewal of the organ loft roof and changes to the drainage which should prevent any repetition). The oportunity was taken to return the historic 4' Harmonic Flute to the Great soundboard (from which it was moved to the choir in 1962, replacing a Lieblich flute), replacing the 4' Octave installed in its place on the Great in 1962. The 4' Harmonic Flute was then replaced on the Choir with a 4’ Wald Flute, derived from Choir division of the dismantled organ of St Aidan (now All Saints) Small Heath. The 4’ Wald Flute pipes from St Aidan's organ are contemporary with the main organ at St Alban’s. The original maker is unknown; they predate Noterman's rebuild. The pipes are of wooden construction, the bottom octave stopped, the rest open, with metal flaps. 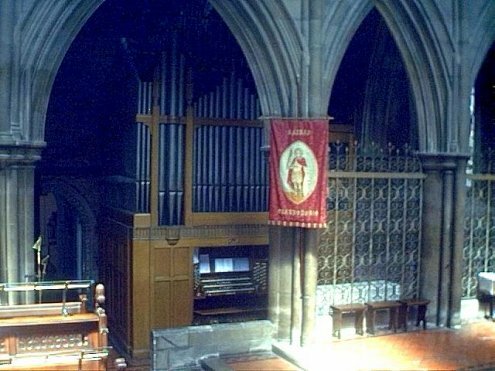 They have been donated by Graeme Martin, Director of Music at St Alban’s, who purchased them (with other ranks and the console) when the redundant organ at St Aidan's was being dismantled. These changes make a wider range of useful choruses available on the Great for both organ music and, particularly, accompanying choir and congregation, while creating a more balanced chorus on the Choir division.